BMW has gone a step further in chassis construction with the patented telelever front wheel suspension. This system separates the two functions of wheel guidance and damping/suspension in a simple and effective manner, thus significantly improving ride comfort. The function of wheel guidance is still performed by the actual fork, consisting of two bars with sliding tubes and fixed tubes providing maximum coverage. This construction with maximum overlap results in a high degree of stability. A trailing link attached at the front of the frame supports the fork and front wheel. A central strut is for suspension and damping. Unlike a conventional telefork, the fork of the telelever system reacts with low levels of bending when braking or going over bumps, therefore the fixed and sliding tubes cannot jam against each other. Other benefits of this construction with a lower diameter of the telelever stanchions as compared to conventional teleforks are the weight advantage and an extremely responsive performance. The low unsprung masses and the quick reaction of the suspension make for excellent road contact over bumpy surfaces. The telelever system allows the geometry to be designed so that the fork bars and thus the front section only respond with minimal dive upon sudden braking, giving the rider improved feedback. Data recordings have shown that releasing the front wheel from suspension effects provides better tyre contact and therefore shorter braking distances. A further advantage of the telelever system: the electronic regulation of the anti-locking system (ABS) is more finely tuned. In spite of the pulsating brake forces, there are no pitching movements. All in all, the telelever system contributes to increased ride comfort, satisfies the riders passion for sport and speed, whilst increasing safety in critical situations on the road. The "telelever" system is easiest described as an “A” arm or "wishbone" that's been mounted to the sliders just above the wheel, originated by design from British company Saxon-Motodd in the early 1980s. It’s really just a unique front fork, where the shock absorber is located between and behind the two primary tubes attached to a telelever arm. The BMW telelever, from Saxon-Motodd’s original design, went one step further in chassis construction. The now patented telelever front wheel suspension has an additional swing arm mounted to the frame supporting the spring. This causes the rake and trail to increase during braking instead of decreasing as with traditional telescopic forks. Along with the Yamaha GTS, BMW is the only other manufacturer to introduce an alternative to the telescopic forks, the standard forks that you're most familiar with on your own motorcycle. This system not only lowers unsprung weight as well as decouples wheel placement function of the forks from the shock absorption function - eliminating brake dive while providing superior traction during hard-braking situations! This system also improves rider stability and comfort while still delivering excellent sportive handling. 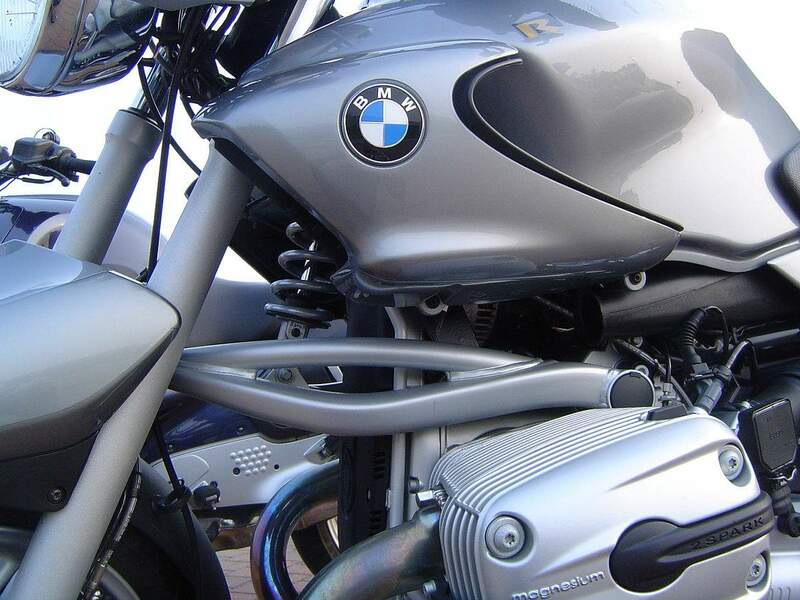 In 1993, when paralever II appeared on the R1100GS, BMW also introduced their new telelever front end suspension system. The problem with traditional telescopic fork suspension is that all the forces acting on the front of the bike are transmitted to the handlebars, and thus the rider. Some people think this is A Good Thing - it keeps the rider "informed" as to what is going on. Others argue that it is a necessary evil and that telescopic forks are an unfortunate accident of history - it's the same reason we got VHS when Betamax was the better system). BMW fell squarely into the second camp, and developed telelever as a method of separating the braking and suspension forces from the steering force. With telelever, there is now a single strut/shock unit in place of the combined spring/shock functions of telescopic forks. Telelever still has front forks, but their primary function now is to make a stiff frame for the front wheel to sit in, and to allow the rider to steer the bike (which is always useful). The strut/shock unit is connected to a wishbone which itself is connected to the frame of the bike at the back via a yoke, and to the crossmember of the forks at the front using a ball joint. When you hit a bump with telelever, the suspension forces are transmitted through the ball joint, across the wishbone and up through the strut / shock unit into the frame of the bike. One of the biggest advantages of this system is that you don't need to engineer an anti-dive system into the forks. The design of the Telelever effectively reduces fork travel under braking to near zero which translates to reduced dive under braking (due to the suspension geometry and the angles of the forces involved in decelleration). Another benefit is that the forces acting on the steering head bearings are dramatically reduced. In fact with telelever, as a rider you have to get used to the concept of braking without the bike diving at the front. It's really quite unique.